I’m back! With a vengeance. Blame it on excessive workload but also developments in Greece and Turkey that kept me constantly busy, sleepless but still going nevertheless. 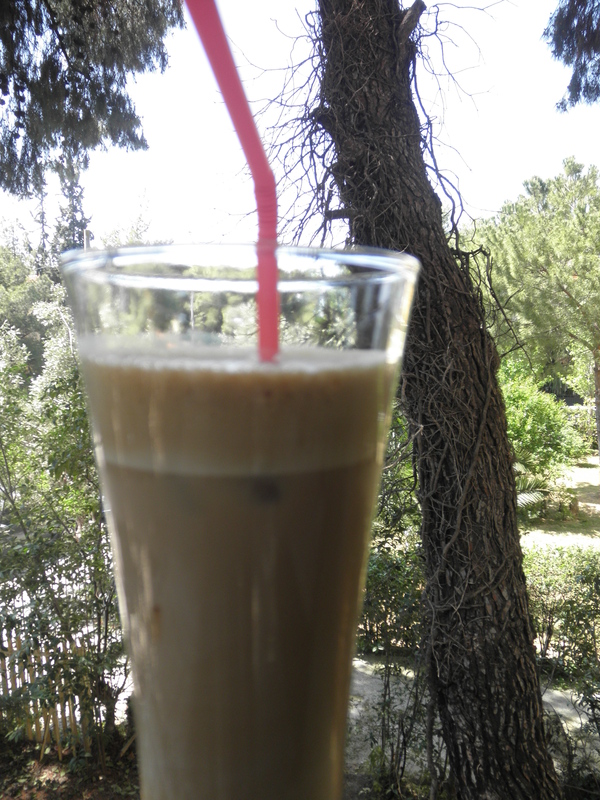 The secret to emergency doses of stamina is no other than Greek iced coffee, otherwise known as frappé. Accidentally invented in 1957 in the city of Thessaloniki, frappé is now the most popular coffee among Greek youth and foreign tourists becoming a hallmark of the post-war outdoor Greek coffee culture. It is also a statement of relaxation and not giving a damn. It has been blamed for the apathy among Greek people to the plight of many of their compatriots due to the recession. However, it is also a powerful tool against fatigue or even burn out. It’s irresistibly tasty too. I remember my English friends trying it, sipping it quickly and asking for another. It was extremely difficult to make them understand that a frappé in late afternoon can be disastrous, never mind a second one. Well, they learnt from experience. 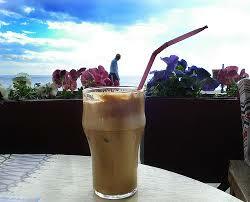 The recipe for frappe is no different to any recipe for coffee. You can have it black or white, with or without sugar. But make sure you have ice cubes available, cold water, a drinking straw and a good cocktail shaker. 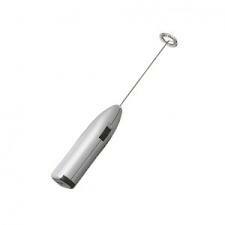 Alternatively you can use this little gadget here, but trust me, shaken is much tastier though I have no idea why. 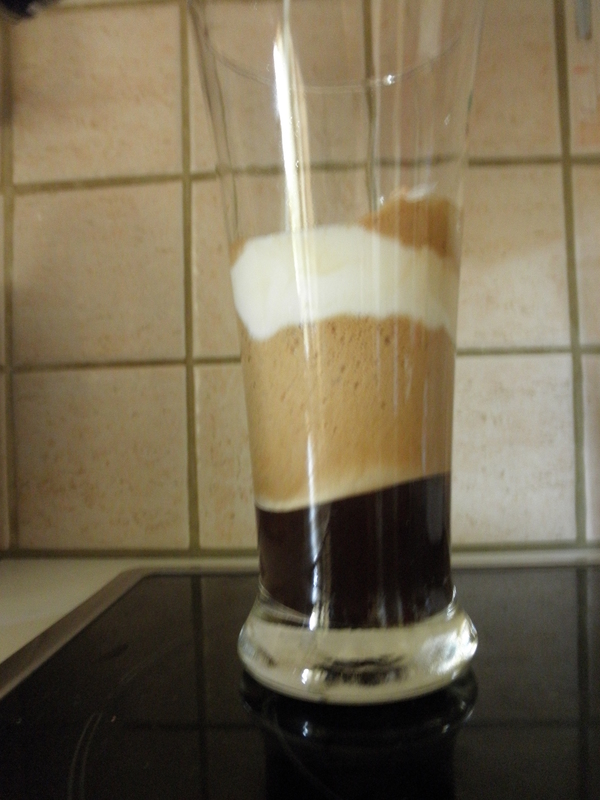 Use a tall glass and add the amount of instant coffee and sugar you prefer. I use Nescafé Gold Blend myself, but any instant coffee will do. Add some lukewarm water to cover. You can whisk it now if you use the mixer but if you’re using a shaker then throw in a couple of ice cubes and shake the hell out of it to form a foam. Slowly pour the coffee foam from the shaker into the glass. Add some ice cubes (in case you’ve used the mixer) and some evaporated milk if you like your coffee white (this is called frappogalo). Add cold water and serve with a drinking straw. So what happened with Greece, ERT and the national orchestra that deserved so many posts and blog negligence on my part? I have written before here how the coalition (made up of three parties: conservative ND, socialist-my-foot PASOK and leftist-my-other-foot DIMAR) has used every fascist tactic there is to impose austerity measures and implement the so-called memorandum. To this end, instead of passing laws through parliamentary procedures they have been using decrees that according to the Constitution (44th Article) should be issued “under extraordinary circumstances of an urgent and unforeseeable need” and “be submitted to Parliament for ratification, as specified in the provisions of article 72 paragraph 1, within forty days of their issuance or within forty days from the convocation of a parliamentary session.” It goes without saying that the government must have insured majority in the parliament to issue such act. Question no1: Which exactly were the “extraordinary circumstances of an urgent and unforeseeable need” that called for the closure of public television network (ERT)? Answer: That depends on who’s answering. If you ask a law professional or an ordinary citizen, they will tell you that there were none. No earthquakes, no tsunamis, no wars in sight. And even in those circumstances, ERT would be more useful than ever since it is the only TV station able to reach even the remotest areas of the country. It is also broadcasting abroad through its ERT World service. BUT: ERT was DIGEA’s main “opponent” in the competition that will take place at the end of the month for the acquisition of digital distribution of television signals in the country. And who is DIGEA (Digea Digital Provider Inc)? It is a private company established by the shareholders of the private national TV network stations ALPHA, ALTER, ANTENNA, MAKEDONIA TV, MEGA, SKAI and STAR who have been broadcasting without state permission since 1989. And who are these shareholders? Some of the richest businessman in Greece and maybe in Europe: Vardinogiannis, Bobolas, Kiriakou, Psiharis, Kontominas and Alafouzos. Question no 2: What was the reason for 19 such acts in the past 12 months? Answer: Same as above. Nothing but the need to secure that very few individuals and companies take hold of the country’s reigns irrevocably. Question no 3: Did Mr Samaras (PM) made sure he had parliamentary majority to proceed with such act? Answer: No. Mr Venizelos (PASOK) and Mr Kouvelis (DIMAR) strongly expressed their opposition to the decree, which means that ERT closed while knowing that it would open again in 3 months the latest. Banners hanging outside ERT headquarters for the greatest classical music concert ever (6 orchestras + 3 choirs, 500 musicians). Tuesday 11th June: Government minister Simos Kedicoglou announces through national network the closure of ERT and the dismissal of all its employees. A few hours later there is black on our TV screens and thousands of people outside ERT headquarters. ERT newscaster, Denia Sarakini with her son, looking optimistic. Journalists and technicians continue to broadcast through the EBU (European Broadcasting Union) as if nothing has changed. Panels with journalists, unionists, artists, academics and opposition party politicians (gvt politicians are invited too but they refuse to go of course) fill the program aired on 24-hour basis having 4, 5 million viewers in Greece so far, according to the EBU. Finance Minister Stournaras, who is now appointed to ERT, threatened any and all television channels, even the EBU, with legal action unless they stopped re-transmitting ERT broadcasts. Empty threats if you ask me and to this day they are. 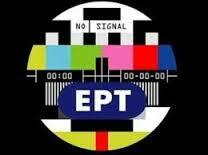 ERT MUST BE RESTORED TO AIR! “We, as Directors General of Europe’s public broadcasters, express our profound dismay at the action taken by the Greek Government on Tuesday, 11 June in shutting down ERT with immediate effect. This undemocratic and unprofessional action of the Greek government undermines the existence of public service media in Greece and its independence from the government. Silas Serafim, stand up comedian at OccupyERT. Monday 17th June: The Higher Court ruled that ERT must be opened immediately, something that has not happened to this day. In any democratic country, Mr Stournaras would be behind bars, since he’s not protected by parliamentary immunity, but hey, this is Mr Samaras’ sultanate. Little girls dancing to Mozart at OccupyERT. Thursday 20th June: Mr Kouvelis (DIMAR) announces that he leaves the coalition and withdraws his ministers. PASOK stays to finish what they started in 2010. So, what else has been going on since the 11th June in ERT’s headquarters apart from broadcasting? Concerts, talks, stand up comedy, happenings with thousands of people attending every single day. This has prevented the government from sending police forces to evacuate the building but they won’t be able to hold back for much longer so please, keep an eye on us, will you? Municipality of Athens Philharmonic Orchestra at OccupyERT this morning. You can read a more analytic report on this issue here. This is a communication letter from all 3 Music Ensembles of the Greek Radio Television (ERT), which as you already know is now SHUT DOWN after a government decree. As of Tuesday the 11th of June 2013 the “National Symphony Orchestra” (est. 1938), the “Contemporary Music Orchestra” (est. 1954) and the Choir (est. 1977) of ERT have ceased their activities.The new institution that is proposed at the moment from the government there is no room for music whatsoever. Our very existence is at stake. We are asking for help and solidarity in any possible way. It is of the outmost importance to make them understand why a Public Television should include Music Ensembles. We would mostly appreciate a written formal statement of support (in both email and normal post if possible) addressed to the Greek government (Prime Minister’s Office, Ministry of Finance and Ministry of Culture, Ministry of State, GENERAL SECRETARIAT OF INFORMATION AND COMMUNICATION) and to your own respective governments as means of applying pressure for the existence and functioning of the Music Ensembles and ERT in general. A European country’s decision to shut down its national Broadcaster constitutes a major strike against democracy and culture that concerns all of us. Music Ensembles of European Radio Television traditionally are pillars of civilization. The unhindered artistic creation and freedom ofexpression is an essential part of the human existence. Please communicate every action to the email of the Artistic Director of the Music Ensembles of ERT .